Fast Heat-Up Rates | Powerful open coil heating elements and a forward curved fan deliver faster heat-up rates and short processing times. 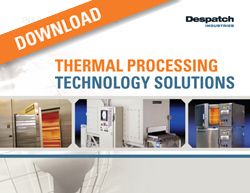 Precise Digital Controls | Digital controls regulate temperatures within tight tolerances. A 3/4 inch (1.9cm) LED panel displays temperatures in large, bright, easy-to-read numbers. Temperatures can be reported in either Fahrenheit or Celsius. Reliable, Trouble-Free Performance | The LBB is designed and manufactured to provide years of dependable service. The fan and heater are top-mounted to prevent damage from spills. When spills do occur, the corrosion-resistant stainless steel interior and nickel plated shelves clean up easily. The motor is permanently lubricated and virtually maintenance free. And Despatch warrants the heater performance for a full five years â€“ the best warranty in the industry. 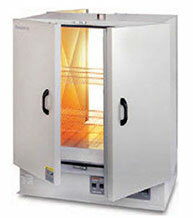 Every LBB benchtop oven is UL and C-UL listed, and receives a thorough performance test before shipping. Forced Convection for Excellent Temperature Uniformity | A top-mounted fan draws air through the heater coils and propels it back to the chamber through plenums in the side walls, resulting in consistent, uniform temperatures. Sturdy Shelves | Standard shelves handle up to 50 lbs. ; reinforced shelves handle up to 200 lbs. All shelves are nickel plated for maximum durability and easy clean up. Built-in shelf supports make it easy to change shelf locations. Fast Delivery | Standard models ship in two to three days. 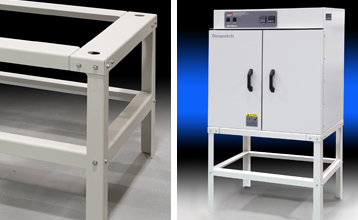 The LBB model is available in five sizes from the small benchtop LBB1-23 (2.3 cubic feet) to the largest cabinet sized LBB2-27 (27.7 cubic feet). The LBB2-27 is available with pass-through doors to allow seamless integration into a work cell and provide continuous product flow through the process.